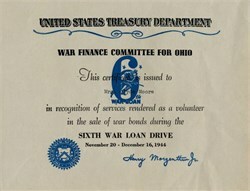 Beautiful recognition certificate from the Sixth War Loan Drive War Finance Committee for Ohio issued in 1944 in recognition of services rendered as a volunteer. This historic document has an ornate vignette of the Sixth Drive logo. This item has the printed signature of U.S. Treasury Secretary, Henry Morgenthau, Jr and is over 69 years old.